Back in the good old days of 2013, Amy Phillips blogged about both Apps Gone Free and Appshopper.com. App developers and publishers are constantly changing the price of apps in the iTunes App Store, and Apps Gone Free is a great way to find apps that have, well, gone free for that day. It combs through the App Store finding apps in various categories whose prices have dropped to 0 for the day or even week. This is a great way to build your library. Though, if an app does go free, and you want it for your whole class, you'll need to have them download it that day. Sometimes these apps will stay free for a while, but sometimes it's only for one day! If you missed an app that went free, Appshopper.com is a great way to track the price of an app you like. You'll need to sign up for an account. Once you do, you can search for the app on the site and add it to your wish list by clicking 'want' on the right hand side. Unite for Literacy is a collection of free non-fiction ebooks for early readers. It works on iPads or computers. The creators of the website have a vision... "We picture a world where all children have access to an abundance of books that celebrate their languages and cultures and cultivate a life-long love of reading." The first time you visit the site it will ask you to pick your "community". Then you can scroll through all the books or use the icons along the top of the screen to sort by category. The books range from single word per page picture books to pages with a few sentences (like the one below). The stories can be read to you by clicking the Narration icon and choosing from 30 different languages! One of my favorite features is that it's an actual person reading it... not computer generated. We've had 1, 2, 3 Math Fonts in GCISD for many, many years. We first blogged about them in 2012. 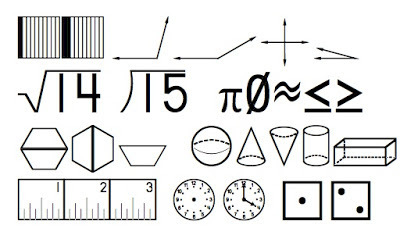 There are 32 total fonts like counting beans/cubes/tiles/bears, clocks, dice, dominoes, fractions, geometry, math symbols, money, pattern blocks, and place value. Once installed, the fonts will show up in Microsoft Office products like Word, Excel and PowerPoint. They won't show up in Google Drive products like Docs, Sheets and Slides. If you're using Google Docs, a workaround would be to type the problem using the fonts in Word and then take a screenshot to insert into the Google Doc. Back in October of 2015, I threw it back to June of 2014, so today's post is a double inception of Throwback Thursday. In June, Vicki shared with us a post about Lucidchart, which you can access through Google Drive or by visiting www.lucidchart.com. Lucidchart is a mind-mapping tool that connects with your Google Drive to create organized, colorful flow charts or diagrams. Since this is actually a different feature and website than Lucidchart, maybe I'm cheating a little on the Throwback. But Lucidpress is run by the same company and announced last fall that Lucidpress for Education would be free. Lucidpress adds another layer to the mix and is almost like a replacement for Microsoft Publisher. Did that make you sit up in your chair a bit? NewsELA is a great resource for leveled non-fiction articles. Teachers can create a free account/class and assign selected articles to students. Each article can be read at a variety of Lexile levels so all students can get similar information but at their own level. Articles also have writing prompt options and quizzes. Some are available with a Spanish translation. How do you use NewsELA in your classroom? Leave us a comment below!